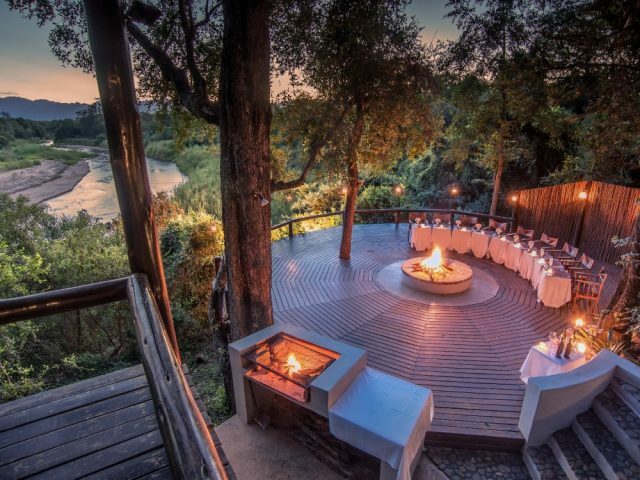 Stunning main deck area with pool overlooking the riverbed – definitely one of the most special places to chill and get in some great game viewing at the same time! 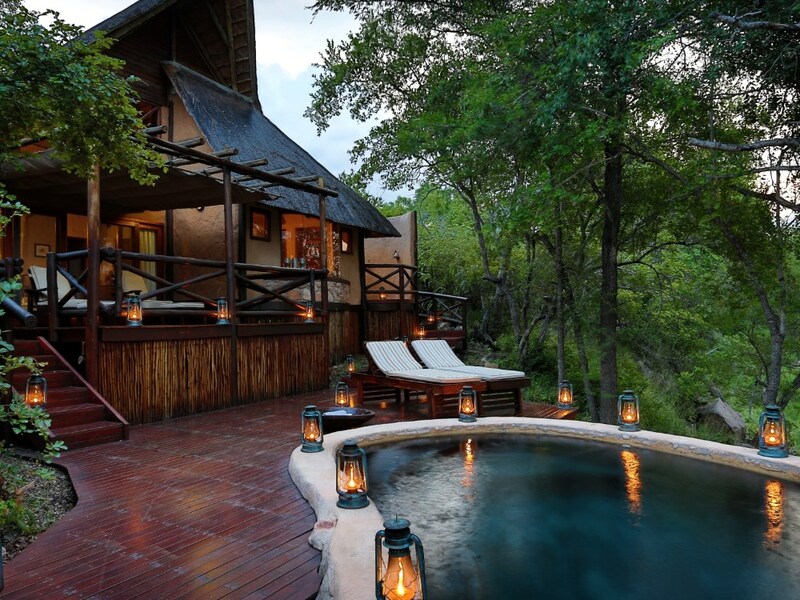 If you can splurge, then go for the gorgeous Giant Eagle Owl or King Cheetah premier suites, each including a private plunge pool – perfect to relax in on those hot summer days! Lukimbi has to be perhaps the most easily accessible of all the greater Kruger lodges – just head off along the N4 from Gauteng past Nelspruit to the Malelane gate and your bush holiday begins! One of the more family friendly of the top lodges – rooms easily house 2 kids plus parents whilst there are plenty of fun supervised activities including making moulds of animal’s footprints, juvenile game drives, even pellet gun shooting! 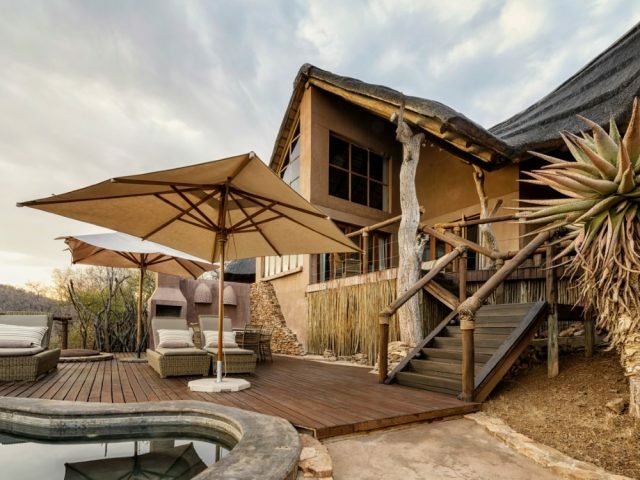 Suites almost bring the outdoors in as the bath and inside showers have large windows allowing unobstructed views of the Lwakahle river and bushveld – or even better enjoy a steaming hot outdoor shower with a private view of the bush! Lukimbi Safari Lodge offers full day walking trails which are unique to the lodge and the perfect way to go "bushwacking" through the veld on foot! 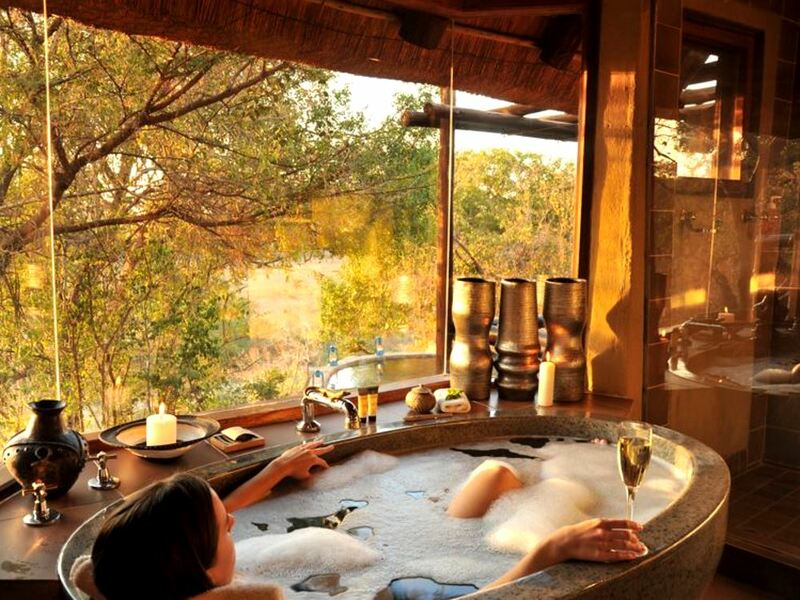 if you're someone who enjoys a long, hot bath, Lukimbi offers one of the best with unobstructed panoramic views through a bay window so you can view the bush and passing animals such as buffalo and hippos whilst enjoying a leisurely soak! Lukimbi has one great advantage over most of the other private lodges in the greater Kruger area – its quick and simple accessibility from Gauteng. An easy five hour drive along the N4 from Gauteng past Nelspruit brings you to the Malelane gate into the Kruger, and from there it’s a short hop to the lodge itself. 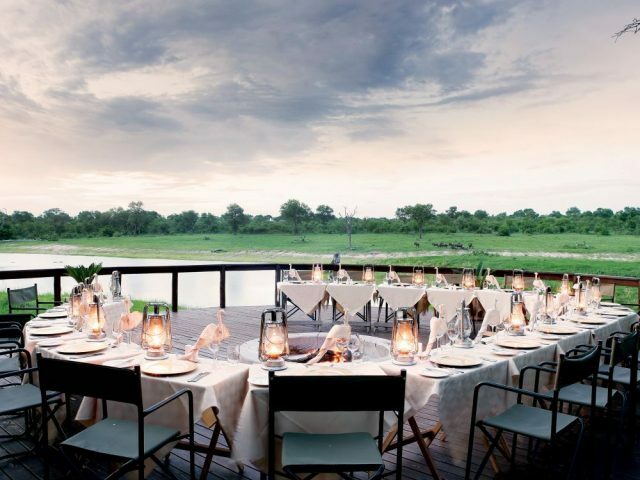 Lukimbi is blessed in having one of the prime locations in the Kruger, an extensive 15 000 hectare exclusive use concession area bounded by three major river systems including the Crocodile River which serves as the southern border of the park. The concession is home to a diverse array of vegetation which in turn results in an excellent concentration and variety of game - vast grasslands dominate the northern portion of the concession, whereas the southern and central areas are more heavily wooded and interspersed with lush riverine thickets. This provides ideal habitat for large herds of zebra, wildebeest and other plains animals. White rhino enjoy the numerous pans and wallows, whilst the shyer and more elusive black rhino can be found in the more thickly wooded areas. Herds of buffalo roam through grasslands seeking the succulent grasses, before moving down to the rivers to amble slowly through the reeds. Elephants can frequently be seen all over the concession and the river in front of the lodge is a favourite place for them to spend hours at a time. You’ll similarly no doubt also be happy to spend many contented hours in the lodge’s luxurious confines! Lukimbi offers 16 spacious air- conditioned suites (14 Classic Suites and 2 larger and more luxurious Premier Suites) which combine stylish luxury and a feeling of rusticity courtesy of the textured wall finishes. Wooden walkways lead to the standalone rooms which are lovely, thatched chalets with ample space and gorgeous river and bush views – they’re spacious enough even to sleep a couple of kids with their parents (just one of the reasons why Lukimbi is great for families) The lounge drops down from the level of the bedroom area and this space then flows out to a covered wooden deck – the perfect spot to sip a drink whilst sprawled in a lounger watching the passing animals and listening to the birds in the surrounding trees! Talking of the main lodge, this is another very attractive area boasting gorgeous and imaginative décor with specially created pieces that elevate it way above the norm – one of the unique stylish features at Lukimbi are the various carved plaster panels showing intricate mystical creatures and African patterns. The main buildings are linked together with open wooden decks, making the most of the view as the lodge meanders along the banks of the Lwakahle river! Lukimbi is a photographers’ delight, both inside the surrounds of the lodge and out in the bush on game drive - the height of the lodge above the river provides fantastic vantage points where you can view the game with a feeling of complete safety. If you're looking for something different then Lukimbi offers wonderful bush walks with an armed ranger, perhaps down to the lovely Crocodile River where you may spot hippo and crocs – this is quite a different experience to see animals on foot where you have the opportunity to look at the smaller things you might just miss while on a drive! In fact there are also (extra cost) full day walking trails at Lukimbi Safari Lodge - anybody who is reasonably fit and healthy and who’s looking for something adventurous will certainly enjoy "bushwacking" on foot! If you want an authentic safari experience at Kruger with a higher level of service and luxury, then Lukimbi is the place for you! No children under the age of 2yrs. Babysitting is available until 10pm and charged per hour for up to a max of 3 children. This needs to be arranged prior to arrival. 2-5 years - can only go on game drive if a private vehicle is hired - subject to availability. During Peak Times: 2 - 8 years need to hire a private vehicle - subject to availability. A superb choice for serious wildlife enthusiasts looking for superior game viewing as the guiding (including Shangaan trackers) is out of the top drawer!